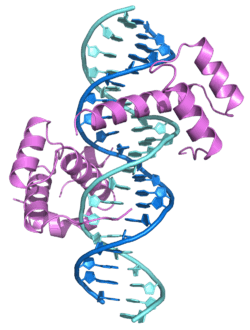 Pre-B-cell leukemia transcription factor 1 is a protein that in humans is encoded by the PBX1 gene. ↑ "Diseases that are genetically associated with PBX1 view/edit references on wikidata". ↑ "Entrez Gene: PBX1 Pre-B-cell leukemia homeobox 1". ↑ Berthelsen J, Zappavigna V, Ferretti E, Mavilio F, Blasi F (Mar 1998). "The novel homeoprotein Prep1 modulates Pbx-Hox protein cooperativity". The EMBO Journal. 17 (5): 1434–45. doi:10.1093/emboj/17.5.1434. PMC 1170491 . PMID 9482740. ↑ Chang CP, Shen WF, Rozenfeld S, Lawrence HJ, Largman C, Cleary ML (Mar 1995). "Pbx proteins display hexapeptide-dependent cooperative DNA binding with a subset of Hox proteins". Genes & Development. 9 (6): 663–74. doi:10.1101/gad.9.6.663. PMID 7729685. ↑ Shanmugam K, Green NC, Rambaldi I, Saragovi HU, Featherstone MS (Nov 1999). "PBX and MEIS as non-DNA-binding partners in trimeric complexes with HOX proteins". Molecular and Cellular Biology. 19 (11): 7577–88. PMC 84774 . PMID 10523646. ↑ Jacobs Y, Schnabel CA, Cleary ML (Jul 1999). "Trimeric association of Hox and TALE homeodomain proteins mediates Hoxb2 hindbrain enhancer activity". Molecular and Cellular Biology. 19 (7): 5134–42. PMC 84356 . PMID 10373562. ↑ Zubair M, Ishihara S, Oka S, Okumura K, Morohashi K (Jun 2006). "Two-step regulation of Ad4BP/SF-1 gene transcription during fetal adrenal development: initiation by a Hox-Pbx1-Prep1 complex and maintenance via autoregulation by Ad4BP/SF-1". Molecular and Cellular Biology. 26 (11): 4111–21. doi:10.1128/MCB.00222-06. PMC 1489093 . PMID 16705164. Sanyal M, Tung JW, Karsunky H, Zeng H, Selleri L, Weissman IL, Herzenberg LA, Cleary ML (May 2007). "B-cell development fails in the absence of the Pbx1 proto-oncogene". Blood. 109 (10): 4191–9. doi:10.1182/blood-2006-10-054213. PMC 1885499 . PMID 17244677. Hunger SP, Galili N, Carroll AJ, Crist WM, Link MP, Cleary ML (Feb 1991). "The t(1;19)(q23;p13) results in consistent fusion of E2A and PBX1 coding sequences in acute lymphoblastic leukemias". Blood. 77 (4): 687–93. PMID 1671560. Nourse J, Mellentin JD, Galili N, Wilkinson J, Stanbridge E, Smith SD, Cleary ML (Feb 1990). "Chromosomal translocation t(1;19) results in synthesis of a homeobox fusion mRNA that codes for a potential chimeric transcription factor". Cell. 60 (4): 535–45. doi:10.1016/0092-8674(90)90657-Z. PMID 1967982. Kamps MP, Murre C, Sun XH, Baltimore D (Feb 1990). "A new homeobox gene contributes the DNA binding domain of the t(1;19) translocation protein in pre-B ALL". Cell. 60 (4): 547–55. doi:10.1016/0092-8674(90)90658-2. PMID 1967983. Van Dijk MA, Voorhoeve PM, Murre C (Jul 1993). "Pbx1 is converted into a transcriptional activator upon acquiring the N-terminal region of E2A in pre-B-cell acute lymphoblastoid leukemia". Proceedings of the National Academy of Sciences of the United States of America. 90 (13): 6061–5. doi:10.1073/pnas.90.13.6061. PMC 46867 . PMID 8327485. Lu Q, Kamps MP (Apr 1996). "Structural determinants within Pbx1 that mediate cooperative DNA binding with pentapeptide-containing Hox proteins: proposal for a model of a Pbx1-Hox-DNA complex". Molecular and Cellular Biology. 16 (4): 1632–40. doi:10.1128/mcb.16.4.1632. PMC 231149 . PMID 8657138. Berthelsen J, Zappavigna V, Ferretti E, Mavilio F, Blasi F (Mar 1998). "The novel homeoprotein Prep1 modulates Pbx-Hox protein cooperativity". The EMBO Journal. 17 (5): 1434–45. doi:10.1093/emboj/17.5.1434. PMC 1170491 . PMID 9482740. Piper DE, Batchelor AH, Chang CP, Cleary ML, Wolberger C (Feb 1999). "Structure of a HoxB1-Pbx1 heterodimer bound to DNA: role of the hexapeptide and a fourth homeodomain helix in complex formation". Cell. 96 (4): 587–97. doi:10.1016/S0092-8674(00)80662-5. PMID 10052460. Jacobs Y, Schnabel CA, Cleary ML (Jul 1999). "Trimeric association of Hox and TALE homeodomain proteins mediates Hoxb2 hindbrain enhancer activity". Molecular and Cellular Biology. 19 (7): 5134–42. PMC 84356 . PMID 10373562. Knoepfler PS, Bergstrom DA, Uetsuki T, Dac-Korytko I, Sun YH, Wright WE, Tapscott SJ, Kamps MP (Sep 1999). "A conserved motif N-terminal to the DNA-binding domains of myogenic bHLH transcription factors mediates cooperative DNA binding with pbx-Meis1/Prep1". Nucleic Acids Research. 27 (18): 3752–61. doi:10.1093/nar/27.18.3752. PMC 148632 . PMID 10471746. McWhirter JR, Neuteboom ST, Wancewicz EV, Monia BP, Downing JR, Murre C (Sep 1999). "Oncogenic homeodomain transcription factor E2A-Pbx1 activates a novel WNT gene in pre-B acute lymphoblastoid leukemia". Proceedings of the National Academy of Sciences of the United States of America. 96 (20): 11464–9. doi:10.1073/pnas.96.20.11464. PMC 18056 . PMID 10500199. Shanmugam K, Green NC, Rambaldi I, Saragovi HU, Featherstone MS (Nov 1999). "PBX and MEIS as non-DNA-binding partners in trimeric complexes with HOX proteins". Molecular and Cellular Biology. 19 (11): 7577–88. PMC 84774 . PMID 10523646. Mikkola I, Bruun JA, Holm T, Johansen T (Feb 2001). "Superactivation of Pax6-mediated transactivation from paired domain-binding sites by dna-independent recruitment of different homeodomain proteins". The Journal of Biological Chemistry. 276 (6): 4109–18. doi:10.1074/jbc.M008882200. PMID 11069920. Thameem F, Wolford JK, Bogardus C, Prochazka M (Mar 2001). "Analysis of PBX1 as a candidate gene for type 2 diabetes mellitus in Pima Indians". Biochimica et Biophysica Acta. 1518 (1-2): 215–20. doi:10.1016/S0167-4781(01)00189-0. PMID 11267683. Liu Y, MacDonald RJ, Swift GH (May 2001). "DNA binding and transcriptional activation by a PDX1.PBX1b.MEIS2b trimer and cooperation with a pancreas-specific basic helix-loop-helix complex". The Journal of Biological Chemistry. 276 (21): 17985–93. doi:10.1074/jbc.M100678200. PMID 11279116. Mal A, Sturniolo M, Schiltz RL, Ghosh MK, Harter ML (Apr 2001). "A role for histone deacetylase HDAC1 in modulating the transcriptional activity of MyoD: inhibition of the myogenic program". The EMBO Journal. 20 (7): 1739–53. doi:10.1093/emboj/20.7.1739. PMC 145490 . PMID 11285237.